For the past weekend I have been surrounded by sugar. A few weekends ago I made truffles, Saturday I made some extremely cute holiday confections at a friends party, and then yesterday I went over to my aunt Jennifer's to learn how she makes her super cute Christmas sugar cookies. These are perfect for Christmas Day parties and also changed to suit any season or holiday. These versatile cookies are a great way to get creative. I thoroughly enjoyed helping out over at her house, and if you decide to make these, they won't disappoint you. 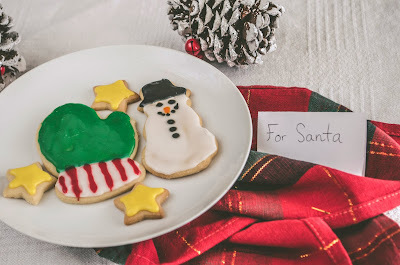 **The sugar cookie recipe I'm posting is not one that was originally used for these cookies however, you may use your favorite sugar cookie recipe or even, although I don't suggest it, frozen cookie dough. Sift together flour, baking powder, and salt. Set aside. Place butter and sugar in large bowl of electric stand mixer and beat until light in color. Add egg and milk and beat to combine. Put mixer on low speed, gradually add flour, and beat until mixture pulls away from the side of the bowl. Place in plastic bag, and refrigerate overnight. Sprinkle surface where you will roll out dough with flour. Remove a quarter of the dough from the refrigerator, sprinkle rolling pin with flour, and roll out dough to 1/4-inch thick. Cut into desired shape. To transfer shape onto cookie sheet, generously coat a cookie spatula with flour before picking up the dough. Repeat every other cookie to prevent sticking. Place at least 1-inch apart a silicone baking mat lined cookie sheet*, and bake for 5 to 6 minutes or until cookies are just beginning to turn brown around the edges, rotating cookie sheet halfway through baking time. Let sit on baking sheet for 2 minutes after removal from oven and then move to complete cooling on wire rack. Can be stored in an airtight container for up to 1 week. *If you don't have a silicon baking mat, you may use parchment paper, however the cookies will be considerably crispier. I also highly suggest if you are really into baking to go and purchase a silicone mat such as: this one. Icing is best made by sight, as if is far less time consuming if you are making large amount of icing to frost with. Simply dump a large amount of powdered sugar to begin as your base. (Anywhere to 4 to 6 cups if you want an idea.) Pour in about 2 teaspoons of vanilla. (and if you don't think there is enough you can always add more.) Then, slowly add milk, stirring all the while. You want to reach a consistency where if you pull up icing with a spoon, ribbons form before slowly disappearing back into the icing. If you go too far, simply add more powdered sugar. Once the icing is the proper consistency, divide into bowls to color. First, plan out how much of each color is needed, then add little amount of food coloring at a time until the desired vibrancy is reached. Pour icing into squeeze bottles. 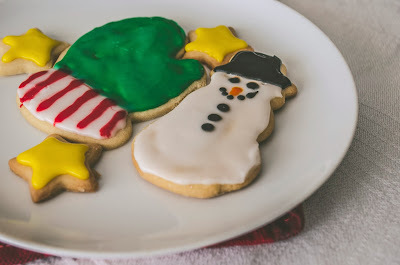 To frost, use the icing in the bottle to outline the side of the cookie and then squeeze an appropriate amount into the center to cover the cookie. Spread the icing to fill in the outlined section.